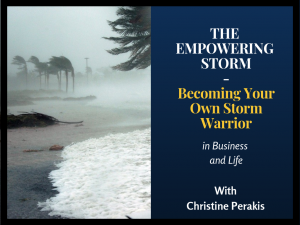 Christine Perakis brings order to chaos as a lifelong professional rescuer, using her business acumen as an attorney, entrepreneur, and certified executive coach, combined with serving as a certified mountain rescuer, EMT, 100-ton-licensed boat captain, and world-champion yacht racer. 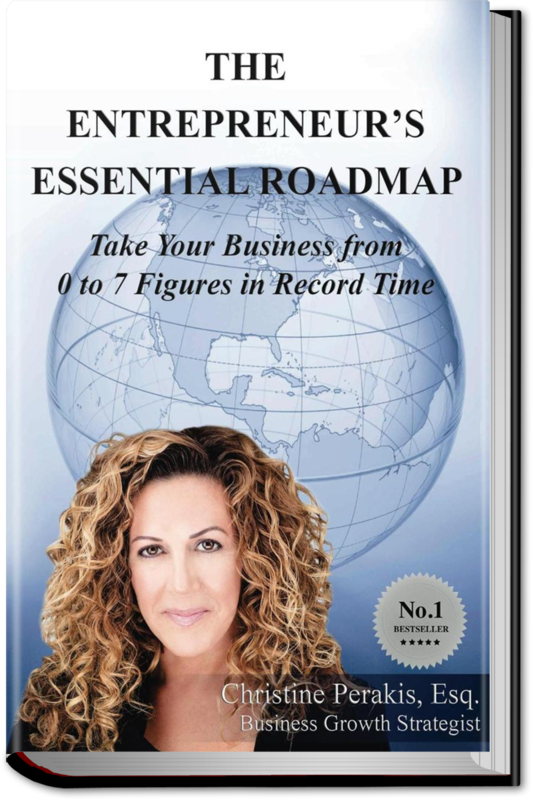 Perakis leveraged these talents to create her small business survival guide, the bestselling book, The Entrepreneur’s Essential Roadmap. Christine experienced and observed a phenomenon she coined and shares in the media: Category 5 Syndrome. It’s the catastrophe after the catastrophe that most people don’t realize they need to prepare for! How to Turn Any Catastrophe into Unstoppable Success! 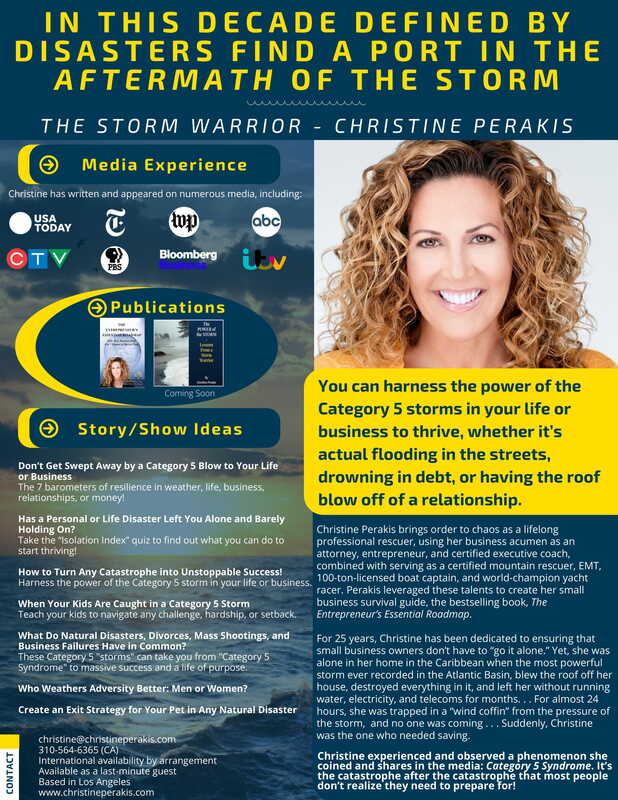 Harness the power of the Category 5 storm in your life or business. Has a Personal or Life Disaster Left You Alone and Barely Holding On? Take the “Isolation Index” quiz to find out what you can do to start thriving! Who Weathers Adversity Better: Men or Women? Teach your kids to navigate any challenge, hardship, or setback. What Do Natural Disasters, Divorces, Mass Shootings, and Business Failures Have in Common? Syndrome" to massive success and a life of purpose. Sensing Low Morale and Even Possible Mutiny in Your Small Business? How to involve your crew, so everyone stays on board! This parenting advice keeps tots and teens hopeful, prepared, and resourceful. The checklist to weather any of life’s challenges. Here’s how to follow the tide to calmer financial waters. Leaks in Your Marriage Boat? Relationship advice that keeps you and your first mate living seaworthy and virtually divorce-proof. Do You Have a Constant Sinking Feeling around Your Business, Career, or Money Issues? Don’t Let Your Vacation Turn into a Natural Disaster! 7 steps to avoid turning your dream trip straight into the eye of the storm. And what to do if you find abandoned pets in the aftermath.